This mask is my absolute favorite! The straps are GENIUS! I also love the way the mask feels on my face. Other masks that I put on are always itchy or move around so much that I can barely stand keeping it on for 5 min let alone 15 min. The Demovia Lace Mask works wonders on my skin. The next day my skin is super smooth and has a radiating glow to it. My skin always feels super moisturized. I LOVE IT! This mask is LIFE CHANGING!
" 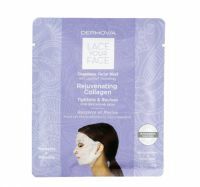 It's already working and I have only used it once I knew it was super when I received the bought single mask Will continue to use and it is well worth the money. " This lace mask by far gives my skin the most moisture. easy to use, stays put so I can actually do something than lie in one position. My face feels smoother and plumper after use. Love it!